In matter of real cars the McLaren F1 is my hero. I'm saying this, not thinking only at the road version, but at all street and race conversions as well. 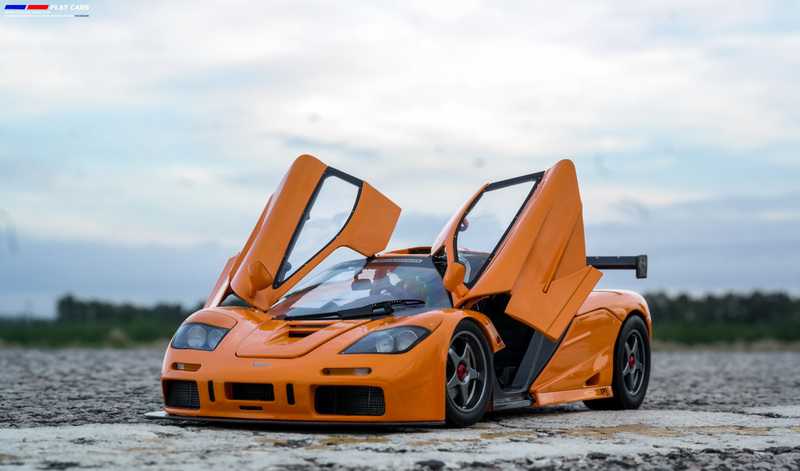 It was something incredible in matter of design and engineering, an extreme car that created and will offer unparalleled moments and feelings in the actual and future automotive history. 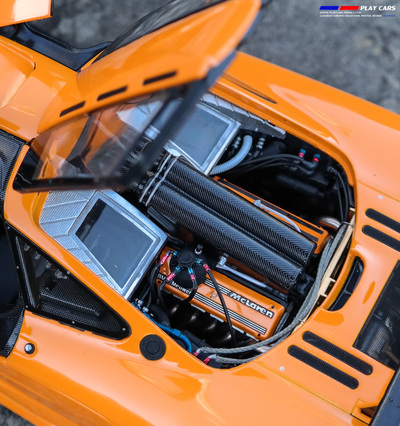 Is almost impossible for me to make a proper introduction here, keeping count about all the technical data and versions created all over the years or racing, being already known that its pedigree is vast and impressive. So, I'll try to be involved more in reviewing its scaled counterpart and taking a complex view of the last released replica. First, I'll mention that the replicated version is the GTR LM XP1, the one-off prototype built ahead of the five production examples of the F1 LM, each one to honor every McLaren F1 GTR that finished the 24 Hours of Le Mans in 1995 in dominant fashion. 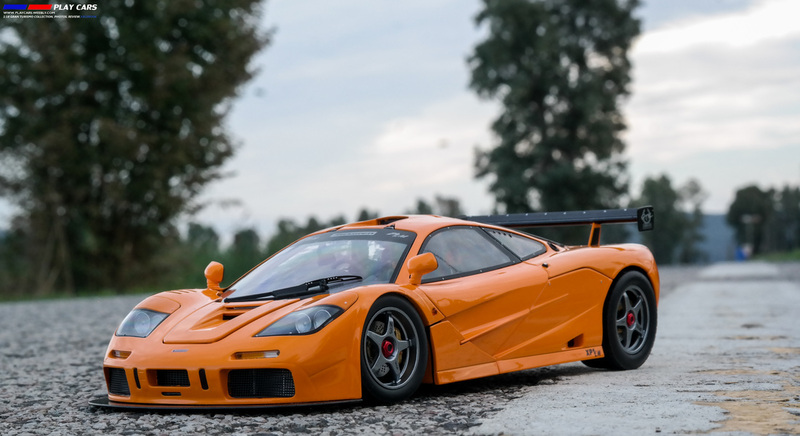 Still, to this date, the McLaren F1 GTR is the single car to have ever won the famous race on its debut. F1LM was superior to the F1 street car, even to GTR on which it was based, keeping its chassis, engine and transmission with minor modification just to remain road legal. 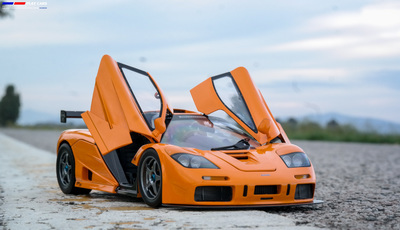 The model was painted in Papaya orange to celebrate the early Bruce McLaren racing cars. Coming as a success in the collector's world, the first scaled replica was released by UT more than 10 years back. It was more than a decent replica for that time, became quickly a rarity and was sold for a little fortune lately. I've managed to buy the same LM XP1 from UT, 4 years ago-reviewed here as well- and was my central collection piece, even if it was paired by newer, better made or detailed models. 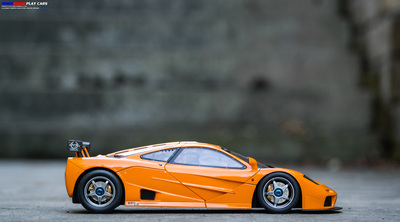 But, the model asked for more and finally received its proper replica when AutoArt released their version few years ago. I never owned or saw one in person, but from the photos and general impression, their creation was incomparable. The high price took me away from it, but after a while, some great news came out: TSM, a fresh name on market announced their intention in replicating the fabulous model. Being impressed by their models already in my collection and to be fair, by the final price I waited in silence. I waited for the right moment to replace my old UT model, sold from now, and this September when the TSM one hits the market I grabbed it eager and impatient. Just in front of me now, I have the very professional looking box, generally designed for TSM models. A lot of warnings, info and photos of the model were painted around on the card box surface and a styrofoam shell was assigned to protect the brand new item. In its upper part were stored the front bonnet, an opening tool and a great finished label including the model's data, to be displayed along with your model. It is a typical and inspired accessory for the TSM models. The model belongs to a limited series of 3.000 pieces and a certificate-card is included. Just open the box and here it is, in its brightening orange coat, my scaled hero! From the first contact, the model appears to be heavy enough for its dimension, having a lot of metal parts and feels solid and well put together. Putting it on a plane surface you'll see quickly how great the stance is! Just perfect, almost kissing the ground with its front lip. Not to forget, be very careful with this part, because is very delicate. Mine was already felt off when I've opened the box, but I managed to fix it without problems. The paint respects the Papaya orange shade and looks good until you'll look harder. I say this, because on some edges and shut lines, the paint was applied in a thin layer, letting the dark metal visible behind. Is glossy enough and on the flat surfaces was applied properly. I found some residues-from the carbon pattern maybe- on my model and fine dust in some angles, not just what you want to see on a brand new model. Shut lines are decent and the functional parts are in harmony with the rest of the body, including here the areas where parts of the complex hings are visible. 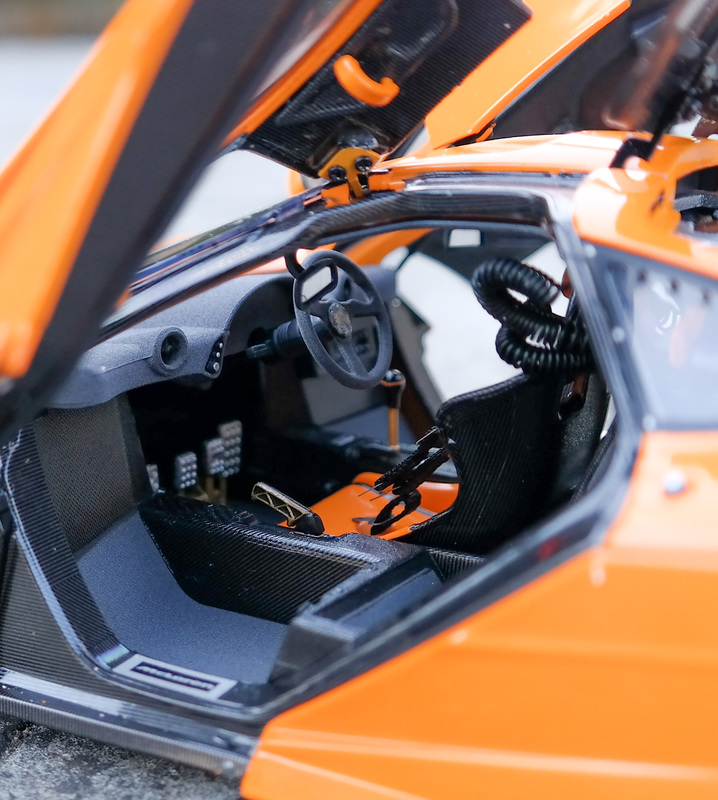 Are not missing few issues: the detachable front lid once fixed, remains higher in comparison with the general line of the body and the the right door doesn't align the sill. The front light lids were made of plastic and only there the gaps are irregular and some glue residues are visible. The model reveals a lot of air vents, all of them covered by real mesh. I was surprised to find them even on the front fender's level, where 3 vents for every side were cut trough. If we are to speak about air vents, then I need to mention that our model features one on the left side, in the front of the rear wheel, that isn't presented on the real car. It is questionable as well, the dimension of the front wheel's arch, because in some official photos the front wheels seem to be fixed too much inside. 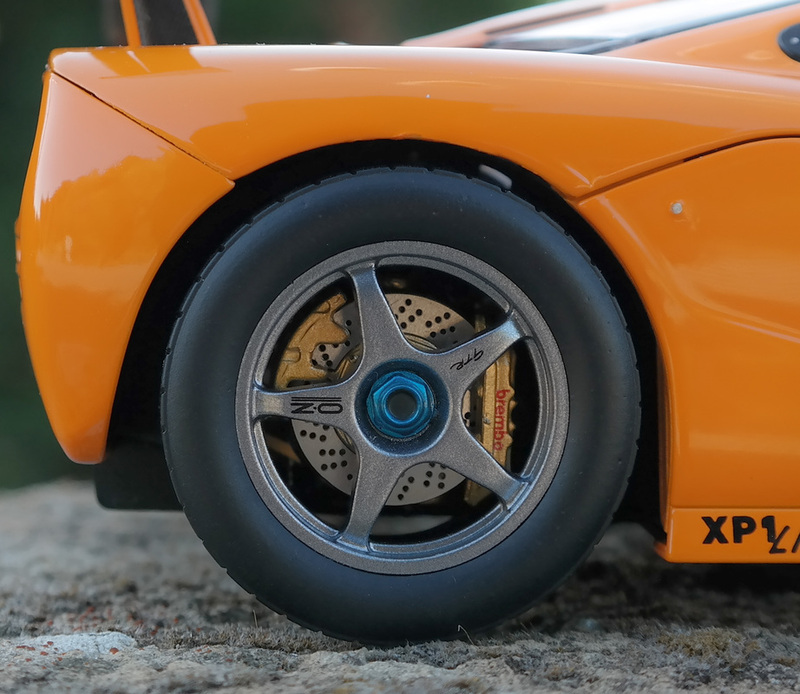 For me, after looking carefully at the model and comparing with some photos of the real car, the problem appears in the superior part of the arch, that comes out about one millimeter more according to the wheel line. This issue is more visible in photos than in real and depends about the viewing angle. All over the body, spoiler or window frames the fixing rivets were marked by silver paint. 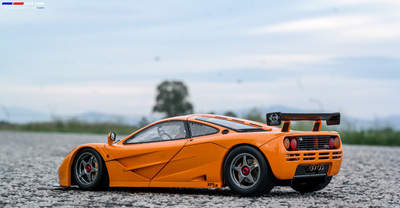 Is a great add, but honestly I would like them made as single pieces, especially for the body panels. The lights are great made, stubless fixed and right colored. The carbon pattern applied on some exterior parts, like the front lip, the spoiler or on the rear panel is something special. Is not so glossy like on AutoArt's models, is printed on, but in the same time keeps a right texture. For me, is closer to the real thing in this version. On the exterior I'll mention few things that I particularly like: the safety pins, replicated by metallic photo-etched parts, on the engine's lid, the exhaust tips and the carbon fiber panel that enclose them-having the rivet heads moulded on- and not least, the big spoiler precisely replicated. 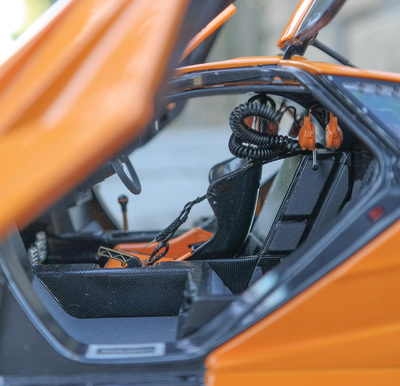 The manufacturer was very careful with the exterior details and this could be proved in the areas where the rivet heads were moulded, on the rear spoiler supports ,replicating both carbon and metallic parts, on the fuel gap and door locks, individually detailed and replicated. Looking the model from the rear side is hard to not observe how beautiful the engine and exhaust details rise through the rear air vent. Two individually made logos, lettering the model name were used here, how long in the front is just a simple sticker. Even if are missing the lettering, presented on the UT version, the wheels are a kind of beauty. First of all, the rims are so well done, very realistic, keeping the „OZ” marks and the central piece individually painted. The safety pins present on the real car, could be the cherry on top here, but are missing. Looking through, the brake system appears to be at the same high level: metallic coated and dimpled brake disks, great finished and „Brembo” printed pads and not to forget, the rotors are the best I've ever seen, being made as single pieces. A very well done job here, proving once again that for details, TSM are one of the best. Opening the doors to observe the interior, I have the impression that the real result of their effort and work is begining right now. Are opening on very thin hinges and a pair of struts are helping them to remain open. Is very nice to see all the chassis's frame covered in carbon pattern, giving a high -tech note to all the cockpit. We have here, finally great detailed, the driver seat, accompanied by textile made seat belts with metallic buckles. The entire dash was covered in a textured material to replicate the Alcantara and must say is a great touch, a similar material being used to cover the floor and the back seats. Maybe the only road car in the world delivered with headphones! And yes, on our model are presented, all 3 beautifully detailed, painted and wired. This is the detail I like most inside, after the carbon covered frame. Is nice detailed, too, the hand brake lever, the steering wheel moulded precisely and covered in the same Alcantara look-alike material. All switches were moulded and individually marked. If will be to ask for something more, than I would like to see the pedals replicated by photo-etched metallic pieces, just because in this form seem to be a little thicker. But this is just me and even without them, the cockpit is brilliant. A great job here from TSM! The engine's lid is metallic and reveals the same thin hinges and a strut to maintain it open. Inside, wasn't replicated the gold film, as AutoArt made on their models, even if could be considered. The engine is nothing less than TSM's usual detailing, like I said before I already have some of their race cars. The F1's experts said that the engine isn't the correct one, just because some accessories from the GTR model were replicated. I'm not one of them, so I'll describe it as it is here, in the front of my eyes. 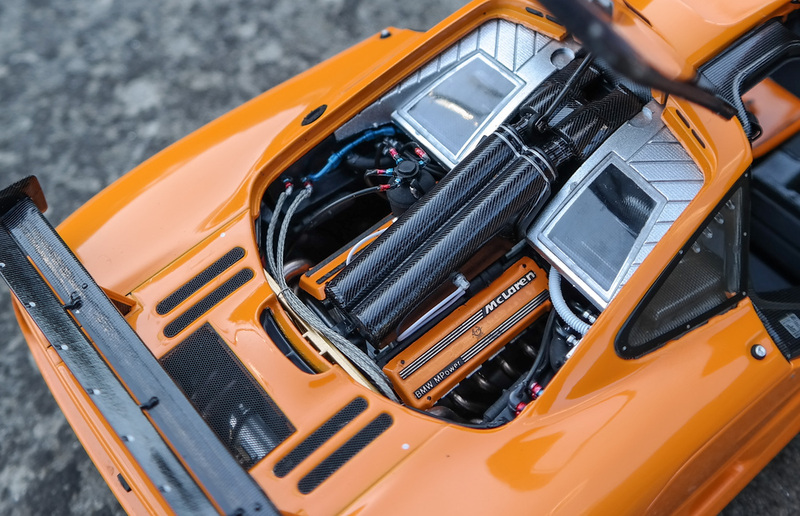 Composed by several individually made and detailed pieces, wired and plumbed, the engine is superb. Isn't missing the carbon pattern, cables and hoses and the great looking braided lines. Unfortunately, the second lid isn't functional to let us see better the intriguing exhaust system. Observed through the air vents it looks amazing, keeping even a particular shade. 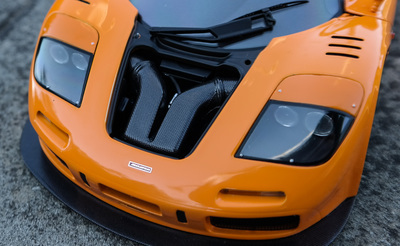 Under the front lid, is visible only the ventilation system, covered in carbon fiber. Is also textured, giving a nice feeling when is touched. Underneath, as on the real car we have a flat base, that in our case is wearing the metallic plate inscribed with the serial number. Were beautiful detailed the brake and suspension systems and the ventilation pipes. The suspension isn't active. Is now the conclusion time and I'll honestly share my point of view. I like TSM models and I like the way they work, but here rushed. I'm almost a fanatic of the real car, but the mistakes made in replicating more or less details doesn't bother me at all. I would like only a better paint job, clean windows without the few fine scratches around, even if hard visible and the front wheels aligned correctly. The model is great detailed in its essential parts, on the interior and engine and as I mentioned in my review are some parts that prove their total involvement in crafting it. I really like the model and exposed is looking so good. 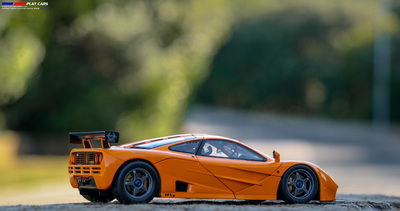 I hope to have the chance to compare it with the AutoArt version, but seen it in the photos, I still prefer the TSM one.